#1 Trinity Western (16-0) continues to dominate the CanWest . The #1 Spartans showed no signs of rust after a weekend off, picking up where they left off to dismantle Thompson Rivers (8-9) (3-1 & 3-0). Hillary Howe led the way with 39 points over the weekend - a dominant 23 point performance on Friday followed by a tidy 16 points including 4 aces. Their undefeated record will come under fire next weekend in the Highway 1 showdown against Kiera Van Ryk and the UBC Thunderbirds (11-7) who swept UBCO (2-16) this weekend to keep themselves in the Top 4. Ahead of them, the #2 Calgary Dinos (15-3) faced off against the #3 Alberta Pandas (13-5) in a classic rivalry match-up this weekend - and it did not disappoint. The Pandas took home night 1 after a 5-set slug fest that saw Kory White drop 24 points and Julia Zonneveld chip in with 20 in way to a 20-18 5th set win. A Pandas win would’ve brought them into a tie with the Dinos - who wanted none of that. They held their 2nd seed on the back of Hannah Tanasichuk’s 29 points while Kate Pexman added another 23 including 5 aces. The Pandas’ White added another 23 points on Saturday to be the highest scorer in the country this weekend with a total of 47. #6 Waterloo (11-0) is impressively keeping their perfect season alive - a big jump for a program who hasn’t had a winning season in a decade. A clean win over RMC on Friday, followed by a gutsy win 3-2 win over a gutsy the Queens Gaels (11-6) gives them a couple of wins over OUA East opponents, further proving their run is no fluke. The Warriors aren’t the top team from their conference, as have yet to face defending National Champions the #4 Ryerson Rams (10-1). Despite a loss to Queens earlier in the season, the Rams still hold the Ring of Power in Ontario. If the Warriors want to be the top team in the OUA - they’re going to have to take it away from Ryerson first. The Rams showed everyone how tough that actually is this weekend with a big 3-2 win over #8 Toronto on Sunday. Despite monster performances by the Varsity Blues Anna Feore (20 points) and Alina Dormann (18 points) [the two even led their team with 15 digs a piece] the Rams dominated the 5th with a 15-6 win on the back of Theanna Vernon’s 23.5 points - including 6 blocks. The win cements them at the top of the OUA - until February when they host Waterloo. The Brock Badgers (8-5) had as big weekend, picking up a win over McMaster (6-5) to take hold of 2nd behind the Warriors. A division dominated by Western and McMaster since it started in 2014 - are we seeing a changing of the guard in the West?? 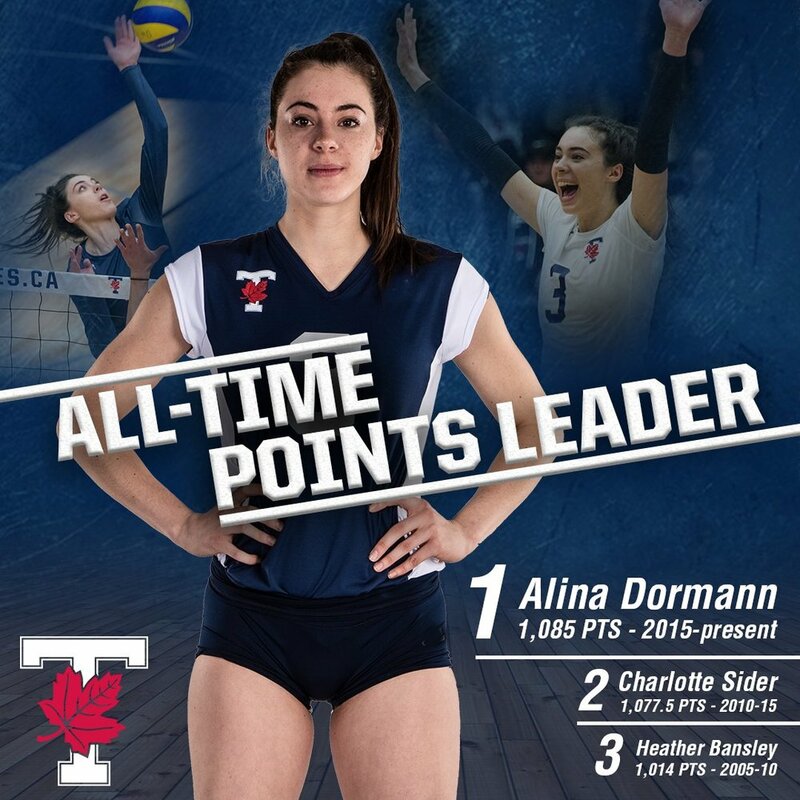 Footnotes: Congratulations to Alina Dormann who passed Charlotte Side as the All-Time leading scorer in Varsity Blues history with 1,085 points. Honestly, who’s doing the scheduling for the RSEQ? The #7 McGill (11-3) had to play the #9 Laval Rouge (8-5)et Or Saturday at 6pm - only to turn around to play the #10 Montreal Carabins (9-4) at home at 2pm! Despite the travel - the Martlets came came away with a pair of 3-1 wins- bouncing back nicely to a loss to UQAM last weekend. On the east cost - the #5 Dalhousie Tigers (14-0) continue to burn through the AUS, gunning for their 7th-straight AUS title. They continued that path with three wins in a trip to St. John’s against Memorial.